Synthetic peptide within Human TSG101 aa 1-100. The exact sequence is proprietary. WB: K562, Jurkat, and SH-SY5Y cell lysates. Human brain lysate; mouse and rat heart tissue lysates. IHC-P: Human kidney tissue. ICC/IF: HEK-293 cells. Flow Cyt: HeLa and K562 cells. Our Abpromise guarantee covers the use of ab125011 in the following tested applications. WB 1/1000 - 1/10000. Detects a band of approximately 45 kDa (predicted molecular weight: 44 kDa). Component of the ESCRT-I complex, a regulator of vesicular trafficking process. Binds to ubiquitinated cargo proteins and is required for the sorting of endocytic ubiquitinated cargos into multivesicular bodies (MVBs). Mediates the association between the ESCRT-0 and ESCRT-I complex. Required for completion of cytokinesis; the function requires CEP55. May be involved in cell growth and differentiation. Acts as a negative growth regulator. Involved in the budding of many viruses through an interaction with viral proteins that contain a late-budding motif P-[ST]-A-P. This interaction is essential for viral particle budding of numerous retroviruses. Heart, brain, placenta, lung, liver, skeletal, kidney and pancreas. Belongs to the ubiquitin-conjugating enzyme family. UEV subfamily. Contains 1 SB (steadiness box) domain. Contains 1 UEV (ubiquitin E2 variant) domain. The UEV domain is required for the interaction of the complex with ubiquitin. It also mediates the interaction with PTAP/PSAP motifs of HIV-1 P6 protein and human spumaretrovirus Gag protein. The coiled coil domain may interact with stathmin. The UEV domain binds ubiquitin and P-[ST]-A-P peptide motif independently. Monoubiquitinated at multiple sites by LRSAM1 and by MGRN1. Ubiquitination inactivates it, possibly by regulating its shuttling between an active membrane-bound protein and an inactive soluble form. Ubiquitination by MGRN1 requires the presence of UBE2D1. Cytoplasm. Membrane. Nucleus. Late endosome membrane. Mainly cytoplasmic. Membrane-associated when active and soluble when inactive. Depending on the stage of the cell cycle, detected in the nucleus. Colocalized with CEP55 in the midbody during cytokinesis. Immunocytochemsitry/Immunofluorescence analysis of HEK-293 (human epithelial cell line from embryonic kidney) cells labeling TSG101 (red) with unpurified ab125011 at 1/10. Cells were fixed with 4% paraformaldehyde. An Alexa Fluor® 555-conjugated goat anti-rabbit IgG (1/200) was used as the secondary antibody. Counterstained with DAPI (blue). Immunohistochemical analysis of paraffin-embedded human kidney tissue labeling TSG101 with unpurified ab125011 at 1/30. Heat mediated antigen retrieval was performed using Tris/EDTA buffer pH 9. A prediluted HRP-polymer conjugated anti-rabbit IgG was used as the secondary antibody. Counterstained with Hematoxylin. Flow cytometric analysis of permeabilized K562 (human chronic myelogenous leukemia cell line from bone marrow) cells labeling TSG101 (red) with unpurified ab125011 at 1/10. Green - Isotype control, rabbit monoclonal IgG. Immunohistochemistry (Formalin/PFA-fixed paraffin-embedded sections) analysis of human kidney tissue labelling TSG101 with purified ab125011 at 1/500. Heat mediated antigen retrieval was performed using Tris/EDTA buffer pH 9. A prediluted HRP-polymer conjugated anti-rabbit IgG was used as the secondary antibody. Counterstained with Hematoxylin. Immunocytochemsitry/Immunofluorescence analysis of HEK-293 (human epithelial cell line from embryonic kidney) cells labeling TSG101 (red) with purified ab125011 at 1/100. Cells were fixed with 4% paraformaldehyde. An Alexa Fluor® 555-conjugated goat anti-rabbit IgG (1/200) was used as the secondary antibody. Counterstained with DAPI (blue). Flow cytometry analysis of permeabilized HeLa (human epithelial cell line from cervix adenocarcinoma) cells labeling TSG101 with unpurified ab125011 at 1/3 (red). Cells were fixed with 2% paraformaldehyde. A FITC-conjugated goat anti-rabbit IgG (1/150) was used as the secondary antibody. Green - Isotype control, rabbit monoclonal IgG. Flow cytometry analysis of permeabilized HeLa (human epithelial cell line from cervix adenocarcinoma) cells labeling TSG101 with purified ab125011 at 1/40 (red). Cells were fixed with 2% paraformaldehyde. 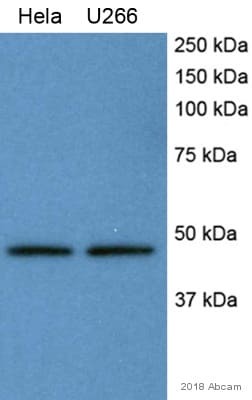 A FITC-conjugated goat anti-rabbit IgG (1/150) was used as the secondary antibody. Green - Isotype control, rabbit monoclonal IgG. Publishing research using ab125011? Please let us know so that we can cite the reference in this datasheet.